On August 5, 2008, CHUP first reported about Dr. Afia Siddiqui, the Pakistani woman who, along with her three children, disappeared in early 2003. Many, including her family and several human rights groups, claim that Afia was actually Prisoner 650, a prisoner-of-war who was reportedly held without trial in a U.S. prison in Afghanistan. Despite the allegations that Siddiqui was held in U.S. custody, particularly after the FBI in 2004 described her as an “Al Qaeda operative and facilitator who posed a clear and present danger to America,” her whereabouts for the past five years were never confirmed. In July 2008, however, Afia allegedly “reappeared” when she attacked and shot a U.S. military officer in Afghanistan. Afia was then transported to New York, where she was charged with one count of attempting to kill U.S. officers and employees, and one count of assaulting U.S. officers and employees, with a maximum 20 years in prison on each charge, [no charges related to the terrorism allegations have been raised]. On September 4th, media outlets reported that she was indicted on those charges. According to a Pakistani news agency, Afia’s lawyer, Elizabeth Fink, told the court that her client was “hallucinating” about her family, saying, “She [Afia] believes she lives with two of the children.” As we learned in September, Afghanistan’s government handed over custody of Dr. Aafia Siddiqui’s son Muhammad Ahmed to Pakistani authorities. Of her other two children, [that went missing in 2003], one is allegedly dead, while the other is still missing. It is a case marred by controversy, ambiguity, and human tragedy. Regardless of what Afia Siddiqui is guilty of, her disappearance, and more importantly, the disappearance of her three young children for five years are cause for concern and hold further ramifications for the deepening anti-U.S. sentiment in Pakistan. According to Geo News on Monday, Afghanistan’s government handed over custody of Dr. Aafia Siddiqui’s son Muhammad Ahmed to Pakistani authorities in Kabul on Monday. Geo cited foreign ministry sources who said that “officials of Pakistan and Afghanistan met today in Kabul after which Afghanistan’s interior ministry official Daud Panj Sheri handed over Muhmmad Ahmed to Pakistani ambassador Asif Durrani.” Siqqui’s son is expected to be on the next available flight to Pakistan. 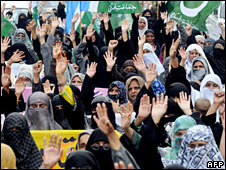 For past posts on the controversy surrounding Dr. Afia Siddiqui’s case, click here. Siddiqui faces one count of attempting to kill U.S. nationals abroad; one count of attempting to kill U.S. officers and employees; one count of armed assault of US officers and employees; one count of using and carrying a firearm during and in relation to a crime of violence; and three counts of assault of U.S. officers and employees. Siddiqui’s case is a very controversial one, with rights groups and her family claiming she was held in a U.S. prison in Afghanistan for about five years prior to her reappearance last month, [for all CHUP posts on Afia Siddiqui, click here.] Siddiqui will reportedly be arraigned on her indictment today. CHUP will continue to cover developments related to the Afia Siddiqui case. Her court hearing will continue on September 3, 2008 at 2:00 pm [EST] in New York City. The Associated Press reported that a New York judge Monday ordered the federal government to provide a doctor for Dr. Afia Siddiqui, a Pakistani woman charged with trying to kill U.S. employees in an Afghanistan gunfight, and who rights organizations and her family allege was secretly taken into U.S. custody about five years ago. In her bail hearing today, Siddiqui’s lawyers said “her health is worsening from wounds suffered in the encounter last month.” Defense lawyer Elizabeth Fink said Siddiqui may have lost a kidney and suffered brain damage.” Reuters cited Fink, who asserted during today’s hearing, “She has been here, judge, for one week and she has not seen a doctor, even though they (U.S. authorities) know she has been shot.” A “frail-looking” Siddiqui reportedly sat in a wheelchair during the proceeding, while about 20 protesters outside the court held posters that said, “Stop U.S. Torture, close Guantanamo, Abu Ghraib & Bagram,” accusing the United States of secretly detaining Siddiqui. CHUP will update this post as more details are reported. For this website’s past coverage on Dr. Afia Siddiqui, click here and here. Living in the United States at the time of the September 11, 2001, terrorist attacks, she was briefly detained and questioned over support for Islamic charities seen as suspicious. She was never charged. In 2003 alleged 9/11 mastermind Khaled Sheikh Mohammed named her under interrogation and in 2004 she appeared on a U.S. list of alleged Al-Qaeda operatives…Yet Mohammed’s testimony has since been discredited by revelations that he was tortured in US custody. UPDATE [11/21]: Afia Siddiqui deemed unfit for trial – click here for latest CHUP article. UPDATE [9/15]: Dr. Afia Siddiqui’s son has been handed over to Pakistan. Click here to read CHUP’s latest update. UPDATE [9/4]: Dr. Afia Siddiqui was indicted on assault and attempted murder charges. Click here to read CHUP’s latest article. UPDATE [7/27]: Click here to read CHUP’s latest update on Dr. Afia Siddiqui. UPDATE, WEDNESDAY 0806 GMT: According to the BBC News Wednesday, Pakistani newspapers reported on Dr. Afia Siddiqui‘s disappearance the day after it occurred, noting “a woman had been taken into custody on terrorism charges.” However, despite an initial confirmation from Pakistan’s interior ministry, both the government and the FBI publicly denied having anything to do with her disappearance several days later. Dr. Siddiqui’s mother [who has since passed away] told the BBC in 2003, that a man wearing a motorbike helmet arrived at the family’s residence in Karachi and told her, “If I ever wanted to see my daughter and grandchildren again, I should keep quiet.” The BBC added, “This is despite the fact that Mrs. Siddiqui’s other daughter, Fauzia, says she was told by then Interior Minister Syed Faisal Saleh Hayat in 2004 that her sister had been released and would return home shortly.” For more details, see the BBC piece, as well as this Washington Post article. Yesterday, CHUP posted a poem written by contributor Hassan Abbas addressed to Dr. Afia Siddiqui, suspected to be Prisoner 650, a prisoner-of-war in reported terrible medical condition located in a U.S. prison in Afghanistan. Siddiqui was allegedly arrested along with her three children by the Pakistani intelligence agency in early 2003 and has been missing since then, according to the Asian Human Rights Commission. Although American and Pakistani intelligence agencies had both confirmed she had been arrested, they reportedly [according to the AHC report] later denied her arrest. Despite this, rights groups and her family allege that she was being held at the U.S. Bagram Internment Facility for more than four years. Recently, British journalist Yvonne Ridley dubbed this Prisoner 650 as the Grey Lady of Bagram, and flew to Pakistan to highlight the plight of this woman. 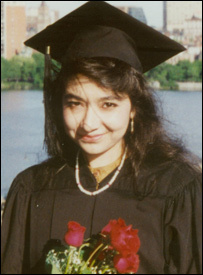 Aafia Siddiqui, who was shot and wounded last month during the confrontation, was expected to be arraigned Tuesday in federal court in Manhattan on charges of attempted murder and assault, U.S. Attorney Michael Garcia said in a statement. A lawyer for her family said the allegations are false. The U.S. military says it took custody of Ms. Siddiqui in Afghanistan last month…A statement by the FBI says Mrs Siddiqui was apprehended on 17 July in the Afghan province of Ghazni by local security forces. According to the statement, U.S. army officers and FBI agents visited her in detention on 18 July. During the visit, Ms. Siddiqui reportedly attempted to kill US officers with a weapon she had snatched. The attempt failed and she was reportedly overpowered after being shot in the chest by the Americans. Afia, now in the U.S., has been charged with one count of attempting to kill U.S. officers and employees, and one count of assaulting U.S. officers and employees, with a maximum 20 years in prison on each charge, reported Western media outlets. So far, however, she has not been charged with terrorism-related counts. Her three children, who went missing with her, have also not been found. Pakistan’s ambassador to the U.S., Hussain Haqqani has reportedly lodged a request with U.S. authorities for consular access to Siddiqui, according to the Associated Press of Pakistan. Ultimately, nobody disputes the fact that Siddiqui, along with her three children, disappeared in 2003. The conflicting reports instead surround what has happened to Dr. Afia Siddiqui in the past five years. If she was indeed Prisoner 650, as speculative reports have suggested, then that is extremely problematic. Regardless of what this woman did or did not do, she is entitled to due process of law. She is, as her sister asserted, innocent until proven guilty, and no human being should be subjected to the cruel and inhumane treatment that she allegedly has undergone. And what of her three children? It disturbs me to no end that a women and her young children can disappear without a sound and no official action is taken. Now that she has appeared in New York, it will be interesting for all of us to watch what unfolds.